Is Greenland the New Iceland? Foolish is the traveller who dare play Scrabble with a Greenlander. They won’t say Utoqqatsissutigaa (‘Sorry’) when they trounce you, for theirs is a polysynthetic language where entire ideas can be expressed in a single – often very long – word. So you don’t get heartburn, you have tarnikkutuuluni (food that hurts the soul inside the chest) and a Greenlandic woman never dates, she has qungujuttagaq (someone she smiles at). This tongue-tying combination of consonants and vowels is also used in nearby Iceland, leading many travellers to assume they’re the same. And, right now, that plays to their advantage because Greenland is starting to position itself as the new Iceland. Happily, the timing might be right. Travellers are increasingly wary of Iceland’s reputation for being overrun. They’re in search of a new untamed environment to act as a salve for their harried city lives. And Greenland does wild in abundance. Locals call it Kalaalit Nunnat, meaning ‘Land of the People,’ which is ironic because for large swathes of time the world’s largest island was uninhabited. Covered by a vast ancient ice cap the size of Spain, its meager population – still only 56,565 – clings to the fringes eking out a living mainly fishing and hunting. Here, Nature rules with such an icy fist that a person’s age is measured in winters and legends of a fingerless sea goddess are still told huddled around hearths. I’d joined Discover the World’s Essential West Greenland tour to see what this frozen land can offer travellers. “Welcome to Greenland,” commented my dreadlocked guide, Lise Kallesøe, rather wryly as we passed the cemetery en route from the airport to Ilulissat, Greenland’s third-largest town. In thick mist, a small digger was scraping away plots beside rows of white crosses. “They have to pre-dig graves in the summer for those they expect to die, or the permafrost makes it impossible in winter,” said Lise. “Gallows humour – literally,” laughed, Simon, our bearded driver. Founded in 1741 as Danish colony Jakobshavn (Jacob’s Bay), townsmen would trade blubber for booze brought by the whalers that hunted humpback and bowhead whales in their thousands to keep to the street lamps of Europe burning and their ladies caged in (whale bone) corsets. Today, the town is a collection of cafés, the Pisiffik (which translates as ‘the place where you get stuff’) supermarket, a superb art museum and the red clapboard house-turned-museum where polar explorer and anthropologist Knud Rasmussen was born. Half Danish, half Greenlandic, his drawings and noting down of local oral stories made him the Father of Inuitology. Like the nearby Ilulissat Icefjord glacier, life here flows as slow as cold honey. There are no roads between towns. You can only get around by foot, boat or helicopter. In mid November, even the sun packs up and heads south for two and half months, leaving the land with the lights off. And until the 1950s, locals lived in turf-roof homes not dissimilar to the pit houses the very first settlers, the Saqqaq, erected here in the Sermermiut Valley over 4,500 years ago. The Unesco-listed 70km-long Icefjord is born from a pitted tongue of glacial ice that produces the most icebergs in the northern hemisphere. “Every day, it releases the same amount of freshwater as they use in New York City,” added our skipper, Claus. Once loose, the Irminger Current carries them northwards and across to Canada. It’s believed the berg that sunk the Titanic calved at Ilulissat. We puttered out on Claus’ boat Blue Jay, jigsaw pieces of ice bumping the hull and the dry wind clawing our cheeks and ungloved fingers. The bergs, raked with deep fissures, glowed as if someone had dribbled blue curaçao between the cracks. Raising my camera to capture the reflections, I saw a black nose protruding into the picture. “Humpbacks!” called Claus. 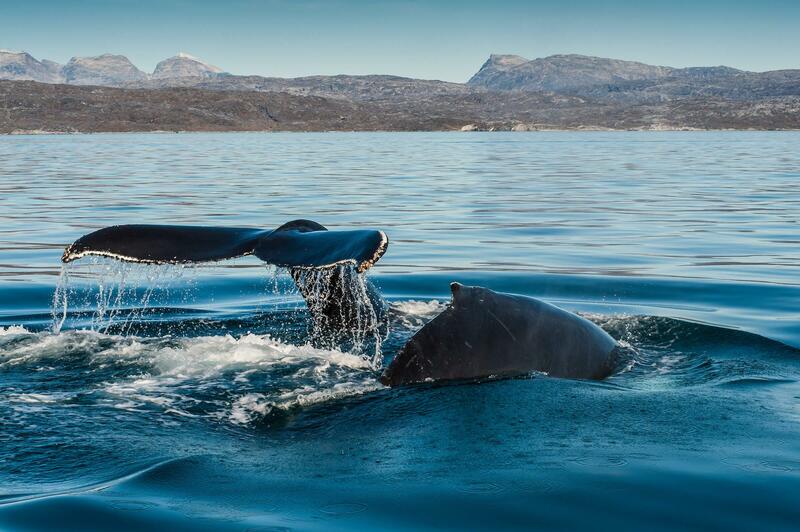 The mother and calf spouted fountains of seawater before diving beneath the boat. 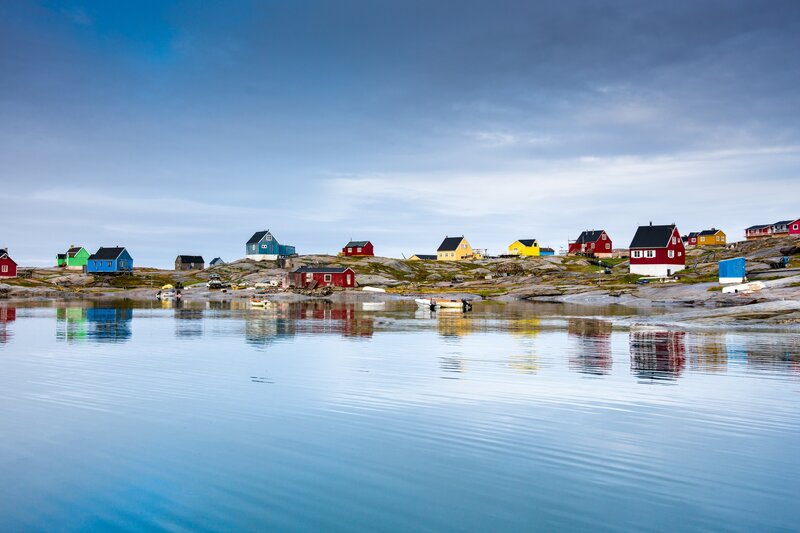 Ilimanaq, a community a half-hour boat ride from Ilulissat, is doing just that. Once a traditional whaling village, today it’s redefining itself as a template for sustainable tourism and how to preserve cultural heritage. Fifteen A-frame cabins have been built along its shore for guests and two 18th-century pine chalets – the oldest preserved examples in Greenland – have been restored to serve as the restaurant and reception for Ilimanaq Lodge. Here, dogs outnumber the population of 48 two to one. This is authentic frontier-style living. Inside the only shop, bullets are on sale next to stick-on Barbie nails, and salted whale blubber beside snowmobile gloves. Reindeer antlers are displayed in backyards in place of rotary washing lines, and working Greenlandic dogs howl for the missing moon. “No petting,” warned Lise, as we wandered past them and the 1908 church. There are no cars or pavements. In these last days of summer, there were just the heathered hills with wild blueberries, mushrooms and crowberries to gorge on and meadows of cotton grass. Later, sat in a sealskin deckchair on the porch of my cabin, I sipped a gin and tonic garnished with foraged bluebells, and watched the bergs hovering off shore like a fleet of ships waiting to lay siege. Cracking bergs sounded like distant gunshots and, occasionally, humpbacks would send up a puff of air as they passed by. Here, at the top of the world, there’s fresh air to breath and long moments of blissful silence. It’s a place to swap Wi-Fi for wide-open spaces and whales. When we woke in the morning, the far hills of Disko Bay Island were dusted with snow. “Winter is coming,” said Lise, referencing Games of Thrones. Indeed, Greenlanders are hoping the ‘cult of the north’ will rub off on them and send travellers their way. And they’re taking steps towards it with the expansion of Ilulissat, Nuuk and Qaqortoq airports and a new state-of-the-art Ilulissat Ice Fjord Visitor Centre planned for 2020. However, there may be more urgency than they’d like. As the vast interior ice sheet continues to melt, international mining companies are moving in to excavate deposits of uranium, titanium and iron. Tourism, if done well like in Ilimanaq, can provide Greenlanders with a more sustainable future – and travellers can help shape that new reality. There’s no need for them to imitate Iceland. Like the unbounded valleys and fjords, there’s space for all. Freedom is their calling card and such a natural part of life here that the Greenlanders don’t have a word for it. And, perhaps, that’s how you finally beat them at Scrabble. EMMA THOMPSON writes for The Telegraph.